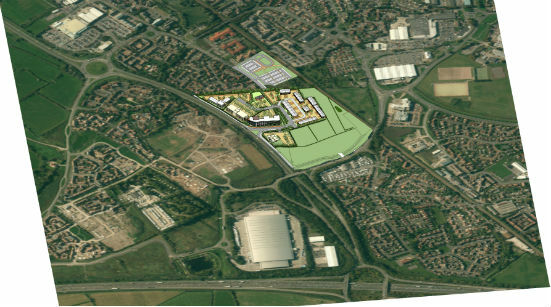 New images have been released by Dowlas which give an insight in to how the business park will look when complete. They show the prominent position of the newly completed Knightstone Housing HQ and Greene King pub but also highlight to potential for smaller units to set up along the back of the business park to create a ‘mini business park’ within the larger WGBP. It is hoped that this will enable potential clients with smaller needs, from 2500 sq. ft to come forward and work with the Design and Build Dowlas team to produce a bespoke building to suit a variety of industries. The new designs also include an Ariel shot illustrating the brilliant location of WGBP, just off J21 of the M5 and adjacent to Worle Parkway train station. Offering new clients the only business park location in the South West with a main line train station less than 5 minutes’ walk away with dedicated pedestrian access.